While over at the Cronin house, there have been all sorts of tangy and delicious vegetable ferments, and fizzy-sweet ginger drinks merrily bubbling, here in our little home, we’ve been culturing raw milk! 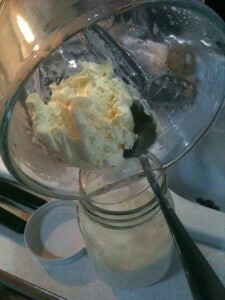 In the past two weeks, I’ve made raw (completely unheated) yogurt, raw kefir, sour cream, and cultured butter, and real, old-fashioned homemade ice cream. I’m still trying to perfect my cottage cheese (which turned out more like farmer’s cheese), but my husband liked it, so I’m happy! Strange as it may sound, raw milk (uncontaminated raw milk) generally doesn’t go bad or spoil. Raw milk has the wonderful property of good bacteria still present in it’s milky-creamy-smoothness that keeps it from “spoiling” or “rotting”, and instead, they cause it to change from “fresh milk” to “soured” or “cultured” milk. Or cream. Or cheese—or other things, depending on how long you let it sit, at what temperatures you leave it, and whether or not you add other bacteria or cultures, or substances (such as yogurt bacteria, kefir grains, or mesophylic cultures). It’s a wonderful part of how God made dairy! GNOWFGLINS.com has been a wonderful resource as I’ve pursued more knowledge about culturing dairy, as have my friends on Facebook (isn’t it a great place to ask questions, sometimes?! ), and various blogs around the internet. I still want to learn to make our favorite raw cheeses, but I think I’ll have to wait until next month at least to take that challenge. Although I don’t like eating a lot of dairy, a little cheese can go a long way towards dressing up a salad, or soup!